Prices and customization options are available on the web site. In most cases, individual products have multiple options available. Click on a product link to see the prices and options. Start in the "Products" section to the left side of the page. Click on the subcategories of interest and, when you find an item of interest, click on the name of the item to see the available options and prices. Click on the Order button to add it to your shopping cart. If you can't find the exact size cabinet that you need, click on the name next largest size and then choose from the available customization options. 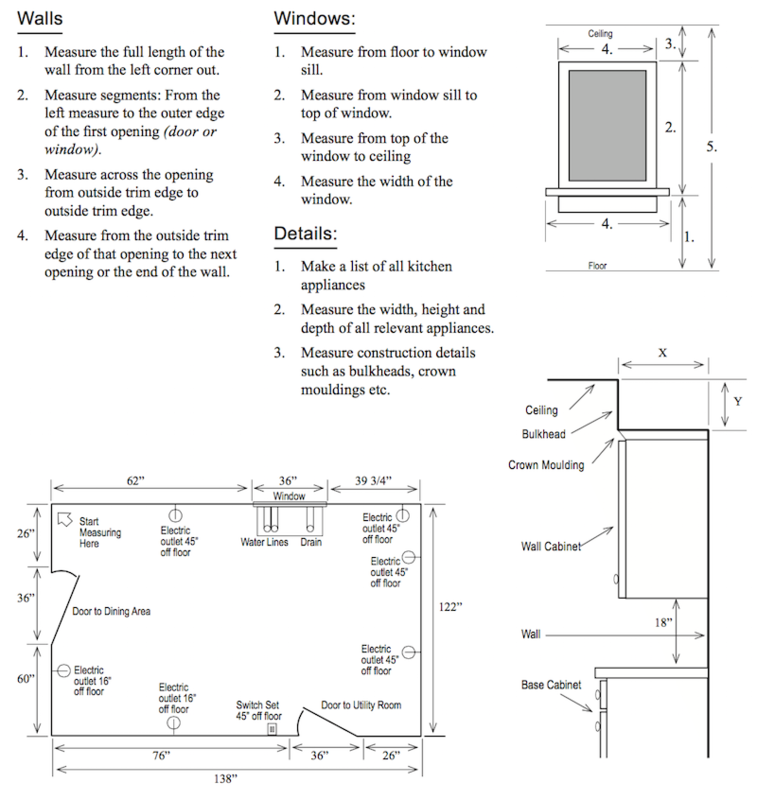 It is important to plan and measure carefully before placing a cabinet order since all orders are custom built and cannot be returned (see our return policy). If you are planning a home office, see our examples of how to use kitchen cabinets to create home office cabinets. Measure your space as precisely as possible. If you will be installing cabinets between two walls, you need to know exactly how wide that space is, but you will probably find imperfections in the surface or alignment of the drywall that may reduce the size of your space by as much as a half an inch. Leave extra space and use cabinet filler strips (in the cabinet accessories section). This will allow you to select cabinets that are slightly narrower than the available space and you can cut the filler pieces to fit any gaps between an end cabinet and the wall. Calculate how much usable space you have to work with along each wall. If you will be installing blind base cabinets, they need to be 6-9 inches shorter than the available corner space in order to fit properly. When you place cabinets on two adjacent walls, don't forget to take into account the depth of the adjoining blind or corner cabinet. You will need to subtract 12 inches from the adjoining wall space if you are abutting a 12-inch deep blind wall cabinet, 24 inches if you are abutting a blind base or diagonal wall cabinet, or 36 inches if you are abutting a diagonal comer base cabinet. Review the cabinet option pages to ensure you are familiar with your choices and your customization options. In your corners, you can either select blind cabinets to create square comers or select a Lazy Susan or Easy Reach cabinet to create a diagonal comer. If you plan to place an appliance or a desk area at the end of the cabinets, see the accessories section for refrigerator or dishwasher end panels. When you place an order, you only need to select those required options that are highlighted in red (see below). You do not need to choose from the optional (black) options. Consider the symmetry of your layout and select base and wall cabinets that align with each other vertically as much as possible. For instance, place a 36-inch wall cabinet directly above a 36-inch base cabinet. Try not to choose too many different sizes of cabinets. 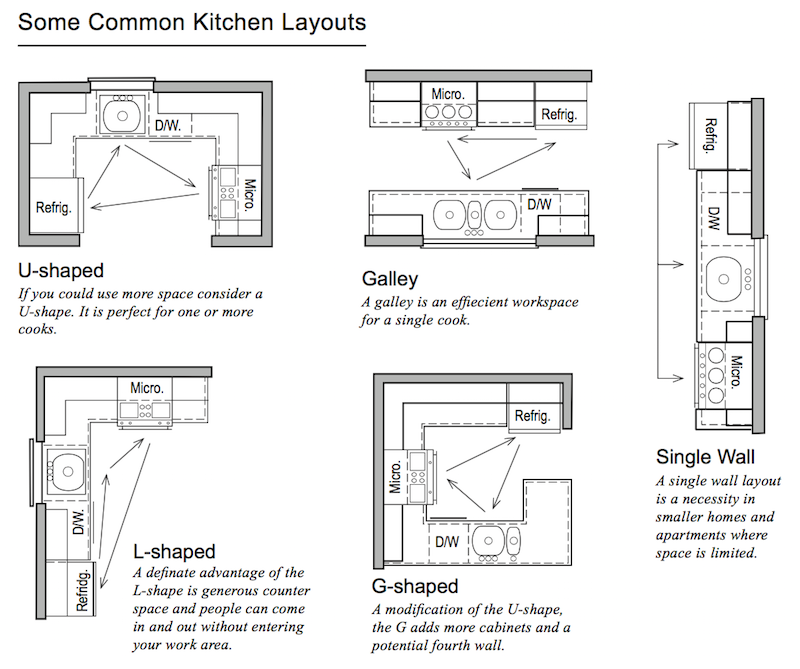 If you have the flexibility, separate your kitchen space into three sections. Place your food storage (refrigerator, freezer and pantry) apart from your cooking appliances (range, oven, cookware), and apart from your clean-up area (sink, dishwasher and dish storage). See below for some common examples.